In this image from TV, a soldier who identified himself as Lt. Obiang Ondo Kelly, commander of the Republican Guard, reads a statement on state television broadcast from Libreville, saying the military has seized control of the government, Jan. 7, 2019. The three uniformed, armed men who took over Gabon state television before dawn Monday had a stern message — and neatly followed a script that has become typical for military-led coups in West and Central Africa. “Wake up your neighbors ... rise up as one and take control of the street," the group’s leader read from a statement. The young men identified themselves as members of the "National Restoration Council" and launched into their appeal. The tiny central African nation — rich in oil but struggling economically — “has lost its dignity,” the leader, a young man in military fatigues, said during the 4:30 a.m. broadcast. The leader, identified as Lt. Kelly Ondo, urged young citizens to “take charge of their destiny.” He lambasted President Ali Bongo, who has been out of the country for months after a stroke in October, for his “shameful” New Year’s television address, in which his speech was slurred. 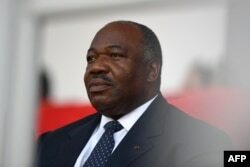 FILE - Gabonese President Ali Bongo attends the closing ceremony of the 2017 Africa Cup of Nations football tournament in Libreville, Feb. 5, 2017. And then, within hours of this attempted putsch, it was all over. By 10 a.m., authorities said they had restored order, killed two of the putschists and arrested several more. But, analysts say, this is likely not the end of the story. Gabon has been politically delicate for years, possibly starting with Bongo’s last election win in 2016. That poll was widely criticized for both its unlikely numbers — in one area, Bongo is said to have won by an extremely high 93 percent of the vote with a 99 percent turnout — which was followed by deadly clashes between protesters and authorities. Opposition leader Jean Ping refused to acknowledge the result, and has since repeated his claim that he won the poll. François Conradie, head of research for NKC African Economics, said the next challenge to the government may look different, but the risk remains. 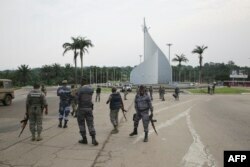 Gabonese gendarmes patrol on the Democracy square in Libreville, Jan. 7, 2018, after a group of soldiers sought to seize power in Gabon. Additionally, Conradie said, the price of oil has fallen, and the government has been forced to cut civil service wages, further stirring discontent. In a report released hours after the attempt, Exx Africa Business Risk Intelligence echoed that prediction. “There remains a heightened risk of military and civil unrest as long as there is no clarity on the condition of President Bongo, and the government does not initiate constitutional provisions for the presidential succession,” the report read. But Conradie said he’s concerned about the government’s heavy-handedness in the wake of the mutiny attempt. Authorities shut down the internet and canceled foreign radio broadcasts.